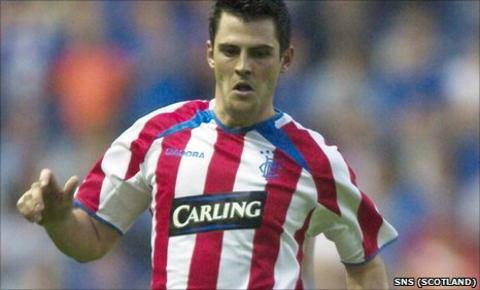 St Mirren have signed former Dundee United and Rangers striker Steven Thompson on a two-year deal. The 32-year-old, who was released by Burnley last month, said he was delighted to join his boyhood heroes. "It has been a life-long ambition of mine to play for St Mirren as they were my first love in football," he told the Saints website. "It will be a brilliant moment for me when I pull on a Saints jersey for the first time." Thompson, who joined the Clarets from Cardiff in September 2008 for £250,000, started just two games for the Championship club last season. And he is relishing his return to Scotland's top flight. "I did have interest from other clubs in Scotland and a few in England as well but once I decided to come back to Scotland I told my agent that there was only place I wanted to go and thankfully that is happening," he said. "I'm really delighted that the move to St Mirren has come together and I can't wait to get started." Following discussions with Saints boss Danny Lennon, Thompson said he was keen to help the side avoid a relegation battle next season. "I think with a wee bit of luck and a lot of hard work that St Mirren could push for a top six place, I don't see any reason why we can't. "That is my aim, you have got to have ambition and you have to put something like that in front of yourself and I think that could be a possibility for us." Thompson played 133 matches in his time at United and 62 while with Rangers, scoring 35 Scottish Premier League goals.